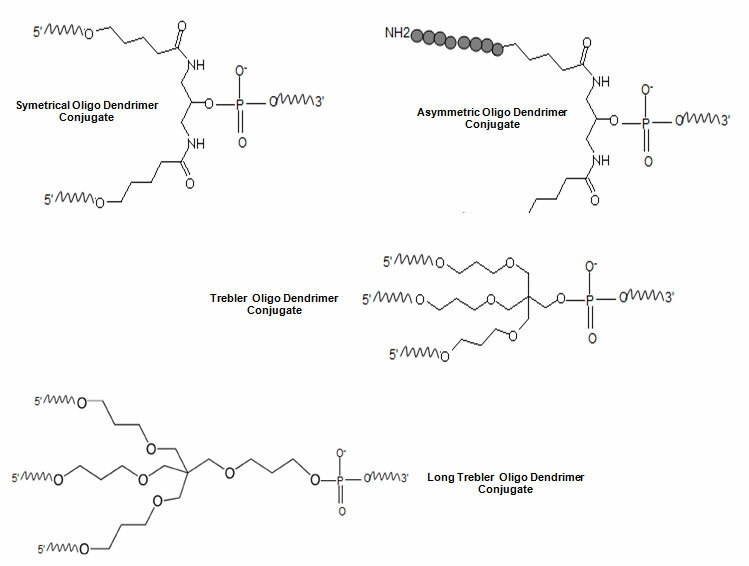 Dendritic Bioconjugation Services - Bio-Synthesis, Inc.
Bio-Synthesis offers conjugation of dendritic nanomaterial (dendrimer or dendron) to siRNA, DNA, RNA, peptides, drugs to form a supramolecular structures. These nano-sized, radially symmetric molecules has well-defined, homogeneous and monodisperse structure consisting of tree-like arms or branches. Dendrimeric constructs can function as multivalent bioconjugation scaffolds, for enhnacement of signals in assays, to solubilize hydrophobic molecules in aqueous environments by interal entrapment, to functionalize surfaces and particles for conjugation, as transfection agents for cells, to create targeted therapeutic constructs for the treatment of disease, as carriers of affinity ligands, and as dditive for other polymer mixtures. Relying on a state-of-the art chemial biology facilities and over 30 years of combine experience in providing high quality dendritic biopolymer complexes, each custom project is metriculously monitored according to Bio-Synthesis's stringent quality assurance and quality control standard that are fully backed up by an bioanalytical laboratory. Price varies based on the proejct specifications. Our service includes materials and labor for conjugation only! Price does not include the cost of biopolymer synthesis and, if deemed necessary, biopolymer modification to introduce additional functional groups, extra linkers, spacers. Please contact us for a quote. Coupling of preactivated small molecule and biomolecule with chemical reactive groups such as amine, thiol, carboxylate, hydroxyl, aldehyde and ketone, active hydrogen through use of varous cross linkers. Lipids: Fatty acids, phospholipids, glycolipids, Myristic acid, Palmitic acid, Stearic acid and any fat-like substances. After labeling , final conjugates must first be isolated from excess or unreacted reagent by gel filtration or dialysis with a matrix having an exclusion limit appropriate to accommodate the size of the molecules being separated. Cross-linked target molecule may then be further characterized by gel electrophoresis. It may be subject to additional analyses with an addtional fee. This including spectroscopic (MALDI-TOF, ESI, LC-MS Fluorescence), electrophoresis, immunochemical biochemical, enzymatical analysis, TLC. QC (quality control) and QA (quality assurance) procedures are also followed independently to offer you double guarantee for the highest quality possible of every delivered conjugates. Moreover, our dedicated technical account managers will guide your project through every step of the process and constantly keep you informed of the latest project progress. To obtain further information regarding custom dendrimer or dendron bioconjugation, contact our National Customer Services Center at 800.227.0627 or contact us online with each inquiry to assist in meeting customer specifications. Dendrimers are discrete, highly branched, monodispersed polymers with three disctinct structureal features: a central core surface functionalities and branching units that link the two. Plain and mixed oligonucleotide dendrimers can be synthesized using novel doubling and trebling phosphoramidite synthons.1,2 Dendrimers offer the following advantages. Incorporation of label using γ-32P-ATP and polynucleotide kinase increases in proportion to the number of 5’-ends. Fluorescent signal also increases in proportion to the number of 5’-ends, if spacers are incorporated between the labels and the ends of the branches. When using a dendrimeric oligonucleotide as a PCR primer, the strand bearing the dendrimer is resistant to degradation by T7 Gene 6 exonuclease making it easy to convert the double-stranded product of the PCR to a multiply labelled, single-stranded probe. Enhanced stability of DNA dendrimers makes them useful as building blocks for the ‘bottom up’ approach to nano-assembly. These features also suggest applications in DNA chip technology when higher temperatures are required, for example, to melt secondary structure in the target. Can't find type of service you need? don't worry, as you can see we've provided myriad of bioconjugation services as described in our service portfolios and much more, just contact our National Customer Service Center at 800.220.0627 or contact us online with your detail project descriptions, in most case, we can accommodate your bioconguateion needs! Peptide dendrimers vary from low molecular weight species of 2 kDa to large protein-like constructs 100 kDa. The size and complexity of the inliidual dendrimers are determined by two factors, the number of layers of branching units (often referred to as the generation number) and the surface supporting the terminal functional groups which can be large peptides or proteins of substantial size. Typically, peptide dendrimers have generation numbers between 2 and 32. Similarto other dendrimers, synthesis of peptide dendrimers is tightly controlled with products of consistent size, architecture and composition. 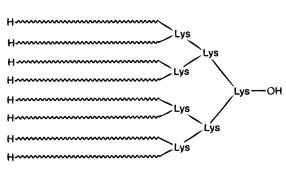 Multiple antigenic (MAP) peptide dendrimers are branched polymers with peptides attached centrally to a dendritic lysine arms or core matrix and a surface of peptide chanins attached to the core matrix. They are synthesized as defined dendritic structures using two methods 1) direct standard solid-phase (Fmoc) chemistry; 2) indirect approach in which peptide an dcore matrix are synthesized separately and conjugated by several ligation methods. Their molecular weights increase geometrically as a function of generation branching of monomers. Usually, two to sixteen peptidyl branches of the same or different sequences are used to form a peptide dendrimer, resulting three dimensional molecule which has a high molar ratio of peptide antigen to core molecule, and therefore, does not require the use of a carrier protein to induce an antibody response. These high molar ratio and dense packing of multiple copies of the antigenic epitope in a MAP has been use to promote immunoresponse. In addition to the applications in immunology, examples in the literature have applied MAPs in areas such as inhibitors, artificial proteins, affinity purifications, and intracellular transport. The MAP, which is chemically defined and homogeneous, was first intended as a means for overcoming the limitations of the conventional method for producing anti-peptide antibodies. In the conventional approach, the peptide antigen is conjugated to a known large protein, or synthetic polymer carrier, to form a peptide-carrier conjugate. Although this strategy has been used successfully in eliciting animal antibodies, it has several inherent limitations. First, only a small portion of peptide antigen is represented in the whole conjugate; second, there is chemical ambiguity in the antigen composition and structure; third, irrelevant epitopes and antibodies may be produced; and finally, carrier toxicity and carrier-induced epitope suppression may occur. The MAP systems have been used successfully to produce both polyclonal and monoclonal antibodies that specifically recognize native proteins. They have also been used to produce sera that have a significantly higher titer of antibodies than sera with antibodies against the same peptides conjugated to the commonly used carrier protein keyhole limpet hemocyanin (KLH; Tam, 1988). grafted peptide dendrimer with unnatural amino acids and organic poly(amidoamine), or PAMAM core, is perhaps the most well known dendrimer. The core of PAMAM is a diamine (commonly ethylenediamine), which is reacted with methyl acrylate , and then another ethylenediamine to make the generation-0 (G-0) PAMAM. Successive reactions create higher generations, which tend to have different properties. Lower generations can be thought of as flexible molecules with no appreciable inner regions, while medium sized (G-3 or G-4) do have internal space that is essentially separated from the outer shell of the dendrimer. Very large (G-7 and greater) dendrimers can be thought of more like solid particles with very dense surfaces due to the structure of their outer shell. Peptide can be attached through the functional group on the surface of PAMAM dendrimers which gives rise to many potential applications. Bio-Synthesis offer Peptide-PAMAM dendrimer synthesis with various core types and generations. contact our National Customer Service Center at 800.220.0627 or contact us online with your detail project descriptions, in most case, we can accommodate your bioconguateion needs!